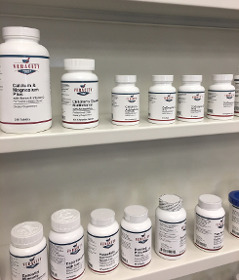 Veracity Pharmacy features pharmaceutical grade vitamins, minerals, herbs and other dietary supplements specifically designed for pharmacies specializing in natural medicine and wellness. These prodeucts are 14- point quality tested nutraceutical products. We offer a selection of 180+ professional grade supplements with new additions and knowledge in clinical nutrition. Consult with our pharmacist today. Call us now and let us now how we can help. Providing you with an exceptional pharmacy experience is our goal. Whether you are looking for bio identical hormones or custom packaging to help you understand your dosing instructions, we are ready to help. Our team provides pharmacy services for every member of your family, including your pets.